The best denim-on-denim outfits for winter start with a pair of jeans—sounds pretty simple, no? That's because pulling off head-to-toe denim—also known as the Canadian tuxedo—is actually easier to do than you might think. There are just a few simple things to keep in mind when building the look. After you've selected your pants, think about what you want to wear on top, making sure it's also rendered in denim, preferably in the same wash as the jeans. And if you don't have something in the same blue shade as your bottoms, opt for the opposite end of the color spectrum entirely—either a much lighter or much darker wash. If you pick something that's similar, but not similar enough, it can end up looking a bit uncoordinated. 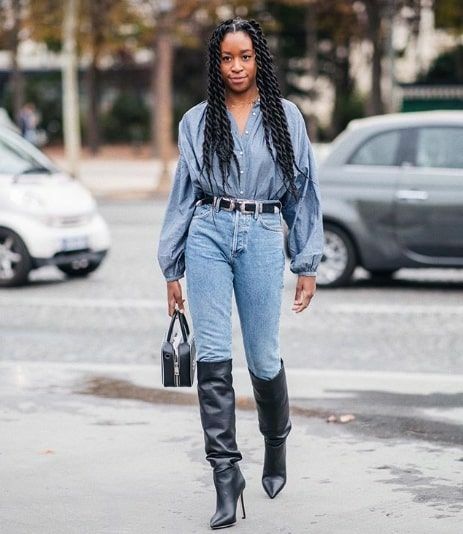 Now, if you need some visuals to pull ideas from ahead of putting together your next denim-on-denim outfit for winter, you're in luck. Ahead, see how some of our go-to fashion girls rock the Canadian tuxedo (and look incredibly cool while doing so), and then shop our selection of jean pieces to scoop up ASAP. Add in a black belt to break up the denim-on-denim look. Try a long denim jacket this winter. And style it with a simple black tee. Throw a plaid blazer on top of your denim-on-denim base. The more denim the better. How cool are these patterned jeans and matching jacket? Ground a denim-on-denim outfit with a pair of crisp white booties. A denim jacket and jeans make a foolproof denim-on-denim outfit. The shearling adds instant warmth. A jumpsuit is so easy to wear but looks so cool. Add in a long-sleeve shirt and leopard-print booties. Check the suede trim detailing. How fun is this ruffle-trimmed denim dress? Next up, check out our favorite black denim jacket outfits for the fall.